In the spirit of Star Wars and Raiders of the Lost Ark, James Wan has created a comic book movie inspired by old serials and matinee spectacles. Aquaman doesn’t quite elevate the material the way George Lucas and his writing partners did, however. Fortunately, Wan is a better director than other Lucas and Spielberg wannabes attempting such a feat. The DC Extended Universe entry isn’t just a goofy guilty pleasure a la Flash Gordon. But Wan does embrace, even more than Lucas and Spielberg, a lot of the cheesy charm of its influences, and he manages to make them work because, well, nobody is taking the iconic fish-talking superhero seriously anyway. For this week’s list of Movies to Watch After, I’ve chosen some directly cited reference points plus some similarly entertaining but imperfect precursors of the sci-fi/fantasy adventure variety. With any fantasy spectacle of Aquaman‘s scope, I like to first go back to Georges Melies, the legendary pioneer of the effects-driven genre picture. Many of his most well-known films ventured underwater. A Trip to the Moon, The Voyage Across the Impossible, and Fairyland; or, Kingdom of the Fairies, wind up beneath the sea following the journeys into space or through fantasy worlds. Under the Seas, a parody of Jules Verne’s Twenty Thousand Leagues Under the Sea that is sometimes also labeled with that very title, is a later work (only surviving in part) that sticks specifically to the depths of the ocean. The film follows a fisherman’s submarine trip under the sea, where he encounters all sorts of real and fantastical marine life, including sea nymphs and giant crabs. For some moments where it looks like the man is surrounded by actual swimming fish, Melies employs his special effect of filming the action with an aquarium between the camera and main stage (shown dramatically recreated in Martin Scorsese’s Hugo during a flashback to the production of Kingdom of the Fairies). It’s not as conceptually out there as Aquaman, though, and it has one of Melies’ disappointing “it was all a dream!” endings. Twenty years before Aquaman made his debut in the pages of More Fun Comics and almost 40 years before the superhero’s origins were rewritten to make him the son of a mortal man and the queen of Atlantis, the first of many adaptations of Atlantida hit the big screen. Pierre Benoit’s 1919 novel tells of French soldiers who discover the lost city of Atlantis beneath the surface of the Sahara (that sequence in Aquaman doesn’t seem so random now, does it? ), where Queen Antinea takes them as her latest enslaved lovers. But that’s not depicted as a favorable fantasy, nor do the main protagonist and the queen spawn a superhero. L’Atlantide is a silent feature by Belgian director Jacques Feyder (who’d go on to Hollywood and famously introduce Garbot talking in 1930’s Anna Christie), one of his first big hits, and it stars exotic dance icon Stacia Napierkowska of Les Vampires fame as the seductive Atlantean queen. G.W. Pabst directed the sound remake (well, three of them, for English, French, and German audiences) in 1932, and interestingly, actor Jean Angelo reprised his role as one of the French soldiers for the French-language version while Metropolis star Brigitte Helm memorably portrayed Antinea in triplicate. Many critics will compare Aquaman to Flash Gordon, and I’ll agree that’s a fine comparison to something more well-known, and I think that fans of Wan’s superhero epic will enjoy the 1980 movie as well as the old Flash Gordon serials. But a more proper root to reference is another 1930s serial called Undersea Kingdom, which is a blatant Flash Gordon ripoff (its hero is the similarly sounding “Crash Corrigan” and he’s accompanied by a professor and a love interest) that actually deals with Atlantis rather than another planet. Unlike the Atlantis of L’Atlantide, here the lost kingdom is found under the ocean floor, in a non-aquatic realm. Produced fast and cheap by Republic Pictures the same year as Universal’s first Flash Gordon serial, Undersea Kingdom is by design a pale imitation. Crash and his companions (including a young boy and a parrot) take a rocket submarine into the ocean to investigate the cause of a series of earthquakes. They discover Atlantis as the source, where an evil tyrant plans to take over the world — not unlike Aquaman‘s King Orm. The serial was compiled as a feature in 1966 under the title Sharad of Atlantis and decades later became an easy target for Mystery Science Theater 3000. The amount of action and spectacle and number of set pieces in Aquaman, as well as the non-serious tone of the movie, kept reminding me of a Charles H. Schneer production. While the 1981 Clash of the Titans might be the easiest and more direct recommendation — if only because it has a Kraken — this 60-year-old fantasy film also featuring effects by Ray Harryhausen is a great place to start with their marvelous matinee masterpieces. The first of three Sinbad movies, The 7th Voyage of Sinbad at least takes place at sea, if not under it, and there are a lot of amazing monsters met throughout the hero’s quest. The thrilling but sometimes goofy adventure movie continues Harryhausen’s Dynamation process, which he’d developed initially for the sea-monster classic The Beast from 20,000 Fathoms. The technique, which utilized layers of visual material in front of the camera reminiscent of Melies’ aquarium trick, created the illusion of actors being on screen interacting with stop-motion creatures. The 7th Voyage of Sinbad was the first movie where Dynamtion wasn’t just employed but was also marketed as part of the advertising of its release (and also its first use for a color feature), declaring “anything that the mind can conceive can now be brought to the screen.” That phrase seems to have also been a goal for Wan with Aquaman. If there was anyone whose movies could almost rival Schneer and Harryhausen’s collaborations, it was George Pal. He’s perhaps best known for the 1953 adaptation of The War of the Worlds, which Schneer and Harryhausen would follow with 1956’s Earth vs. the Flying Saucers. Now it was Pal’s turn to follow Schneer with a Sinbad-like adventure set in ancient times with the story of how Atlantis became lost. The team of artists who worked on the movie included Jim Danforth, who would later work with Harryhausen and is considered by many to be the next most notable master of stop-motion effects. Obviously, there’s the Atlantis connection to Aquaman, but there are some more specific links, too. Atlantis: The Lost Continent kicks off with a fisherman (rather than a lighthouse keeper) finding a woman who turns out to be a member of Atlantean royalty. Her king is also planning to conquer the world, and his people have created a heat ray weapon meant to help in this plot. But while the movie does depict the destruction of Atlantis as falling into the ocean, there’s no implication that the kingdom continued as an aquatic civilization but rather the survivors spread to other parts of the world instead. It’s funny that Wan mentions both Mr. Miyagi in The Karate Kid and Obi-Wan Kenobi in Star Wars since both roles were themselves so influenced by Mifune characters that the actor himself was up for both parts and lost out on the former (for not being lovable enough) and turned down the latter (he thought it would cheapen the samurai image). Maybe if he’d been alive today, he could have been offered the Vulko gig, too. 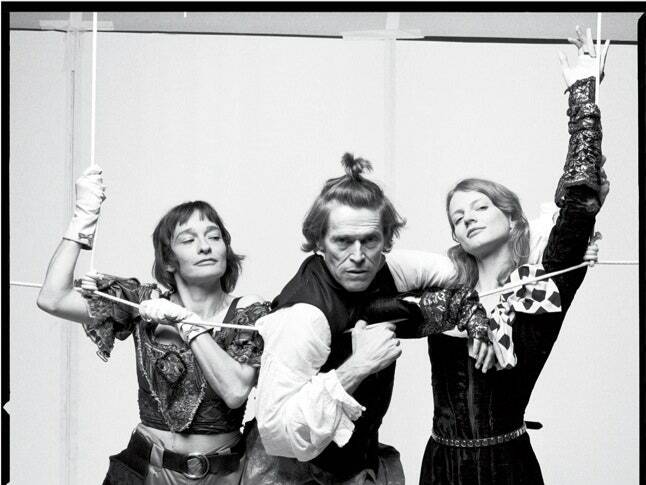 Instead, Dafoe gets to show the world what only theatergoers who saw him in 2009’s Idiot Savant could enjoy before: what he’d look like as a samurai. For the influence, I suggest a look back to one of Mifune’s less-famous collaborations with filmmaker Akira Kurosawa: Sanjuro. This sequel to Yojimbo (where, even more than Vulko, his character is playing people against each other) is a lighter more humorous film compared to the others (a la Aquaman compared to other DCEU efforts) and is the only one I can think of where Mifune has a sort of mentoring role. In a way, his scruffy and cynical ronin is more Aquaman than Vulko, but that just makes this samurai masterpiece all the more fitting a recommendation. Three and a half years since the release of Avengers: Age of Ultron, another superhero movie pays homage to Pinocchio. Now it’s DC’s turn, but it’s not necessarily Walt Disney’s animated feature (which I recommended then) being referenced. There’s no corporate motive for that to be the case. Aquaman (Jason Momoa) does acknowledge that he got his idea to hide in a whale from a movie, not a book, and for the sake of synergy perhaps he means New Line’s creepy live-action version from the ’90s starring Jonathan Taylor-Thomas. But I can’t recommend that, and anyway it’s a sea monster not a whale in that movie. But the thing is, Romancing the Stone (though much less so its sequel, The Jewel of the Nile) is primarily Turner’s movie. Much of the time, Aquaman seems like more Mera’s story than the title character’s, so that fits. Maybe the sequel will recognize how much she’s the true hero (more on that in a moment) and call the sequel Aquaman and Mera, similar to what Marvel did with the Ant-Man sequel, Ant-Man and the Wasp. Disney’s Moana also reminds us that Mera is the one doing much of the lead work. Aquaman is the sort of movie we see too often where a woman capable of being the protagonist on her own guides a big strong man who is reluctant and clueless. Because he is the chosen one, not her. See Ant-Man and The Lego Movie as prime examples that have actually called attention to their own issue with this scenario. But it’s Moana that doesn’t play around. The woman is the main character and her dumb male counterpart is basically her sidekick even if he first thinks the reverse. While the dynamic of the man and woman here is just a repeat of Romancing the Stone, I had to include both movies because one is namechecked by Wan while this other one has more plot parallels (differently than with Wonder Woman). Both Moana and Aquaman involve a woman tracking down a man to help in the quest for a sort of pole weapon — magical fish hook in the former, trident in the latter — that is ultimately found by diving deep through a trench leading to an air-pocket secret world beneath the ocean floor and requires the defeat of a big sea monster in order to retrieve it. Mera might look more like Ariel from Disney’s The Little Mermaid, but she deserves to treated more like Moana, whose movie is like a feminist update on that earlier animated feature. When we think of Aquaman, we think of James Cameron. He was the director of the fake Aquaman movie in Entourage, after all. James Wan’s movie also looks a lot like what we imagine the upcoming underwater-set Avatar sequel will be like, but not quite as well-directed. I’m also reminded, during a lot of the bioluminescent sights of Aquaman‘s deep sea life, of the 2005 documentary Aliens of the Deep, which is co-directed by Cameron and Steve Quale and presents an exploration of parts of the ocean where unusual but real creatures dwell. This week’s documentary pick, though, is another, less-serious Cameron production. Made for National Geographic and directed by Simcha Jacobovici (The Lost Tomb of Jesus), Atlantis Rising more out there than other sea-exploration docs involving the Titanic and The Abyss director. Can state of the art technology and ancient maps and texts be combined to solve one of the greatest mysteries of all time? You’ll have to watch to find out. And then afterward you can wonder if Cameron’s going to tackle the Bermuda Triangle or go searching for real mermaids next.